There is a focus on quality cooking and style at the premium end of the market. Cooking appliances, cabinetry, rangehoods, sinks, fridges and heating options are making true outdoor kitchens a reality. Electric barbecues provide an alternative for apartment dwellers who may have space restrictions or are unable to use gas for safety reasons. The importing of poorly-featured, basic barbecue models to be sold cheaply as spot purchase is impacting sales in the barbecue category. To counter this trend, serious suppliers have chosen to hold their ground, and their RRPs, by continuing to market products with a focus on quality. They are banking on Australians’ love of barbecuing and foodie culture to keep average sales prices (ASPs) in the category high. Outdoor kitchens are closing the gap that separates them from their indoor equivalents, with the addition of weather-proof rangehoods, fridges, sinks, heating and storage solutions. While the cooking products themselves — built-in and portable, large and small — are offering a range of different cooking functions, opening up a world of recipes for alfresco living. These days there is more than one way to sizzle a sausage. 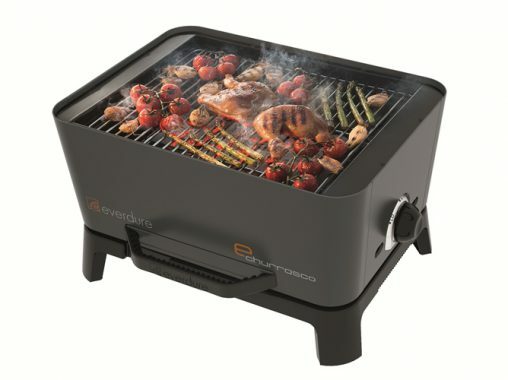 Available in orange and graphite, Everdure’s portable e churrasco Quick Start Charcoal BBQ (styled in lower case; RRP $299) is ready to use in just 15 minutes, combining the convenience of gas ignition with the flavour of charcoal cooking. Anita Gounder, divisional manager of Everdure, which distributed by Shriro, said barbecue sales reflect range cutting and lower stock holding in stores. “Increased off-the-shelf purchasing from Chinese manufacturers at spot rates is driving selling prices down, and our efforts to hold margins up on flat total profits is costing market share,” she said. This summer Everdure is partnering with Surfing Australia’s Wahu Surfer Groms Comps, providing a barbecue and a chef for 10 competition events. They also have a barbecue Summer Essentials promotion planned: depending on the value of the barbecue purchased, consumers will receive an accessories pack. An MyAlfresco outdoor kitchen installed in Ascot Vale, Melbourne, featuring a Smart barbecue, single door Husky Fridge and cabinetry, starting from RRP $6,999.The all-weather kitchen comes with a 10-year warranty on cabinetry and benchtops. Nick Detsirapis, national business development manager for MyAlfresco, a division of Arisit, said a major issue in the barbecue market is the influx of “barbecue’s that do not perform to Australian standards and the expectations of the Australian public”. Turning this into a positive, he said that more and more Australians will desire a high-performing barbecue. “With the ever growing alfresco living market the Australian consumer will place a lot more emphasis on the performance of their barbecue and thus opt for a higher specified product,” he said. Arisit MyAlfresco offers a wide range of outdoor cooking appliances ranging from Smart-, Steel- and Capital-branded barbecues through to wood fired pizza ovens. 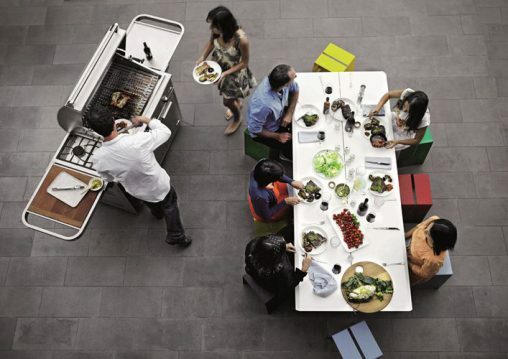 Prices for MyAlfresco’s modular outdoor kitchens start from RRP $5,999. At the top of the range, these kitchens include barbecues and hoods, glass back bar fridges, pizza ovens, kitchen sinks and taps. Just as they would indoors, consumers can design a tailor-made outdoor kitchen that will complement their outdoor space. The BeefEater Artisan Outdoor Kitchen is a unique, masonry-looking modular kitchen available in a choice of units and configurations, boasting an easy installation process and materials to withstand the great outdoors. Prices range from RRP $4,900 to $10,000. The pulling power of a barbecue can withstand a soft retail market, says Peter Woodland, managing director of BeefEater Barbecues at Woodland Home Products. “The general trend being experienced in the marketplace is that retail is soft. Grudge purchases along with unnecessary discretionary ‘wants’ are most adversely affected, however, lifestyle products are not doing so badly. 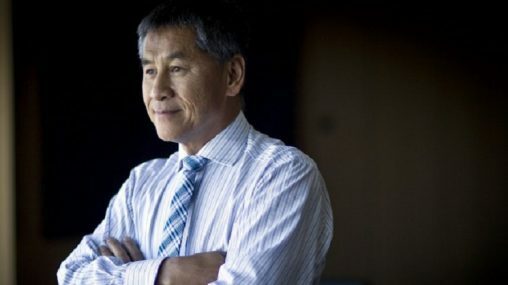 “During a number of recessions I have experienced, barbecues are lifestyle products that are embraced by consumers for reasons that they are fun to use, are a cheaper form of entertaining than restaurants and are very much a part of our DNA as a culture,” he said. Woodland identified a number of trends in the barbecue market including outdoor kitchens, portable barbecues and solid fuel barbecues. Beefeater are capitalising on these trends with new products for this season: BeefEater Artisan Outdoor Kitchen, BeefEater Outdoor Fridge and the BeefEater Solid Fuel BUGG Barbecue. 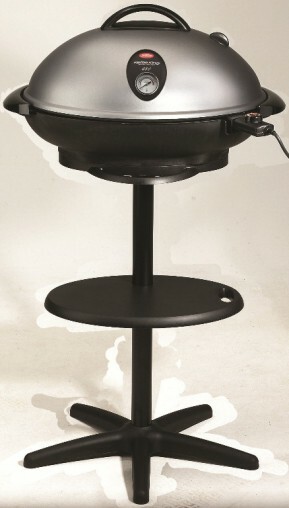 This last model uses charcoal, briquettes or heat beads rather than gas or electricity and may appeal to foodies wanting to try out different techniques with their barbecue, including giving food smokey flavours. 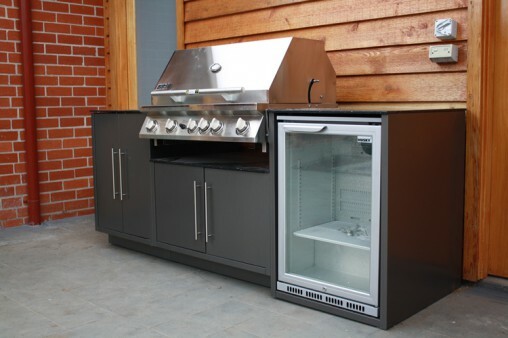 The BeefEater Artisan Outdoor Kitchen is a unique masonry-looking modular kitchen, available in a choice of units and configurations, featuring BeefEater’s Signature 3000 four-burner barbecue, three cabinets for storage, a separate modular fridge unit and a sink. Supported by a 15-year parts and labour manufacturer’s warranty, a DCS Grill from Fisher & Paykel is an “investment piece and should be promoted accordingly”, says marketing manager Kara May. Pictured is the 48-inch freestanding model (BGB48-BQR, RRP $9,596), which combines stainless steel burners and grilling grates, as well as a heavy duty infrared rotisserie for outdoor roasting. The outdoor kitchen, in one form or another, is fast becoming a ‘must have’ in Australian homes, said Fisher & Paykel marketing manager, Kara May. “Whether it’s an apartment balcony, or a full outdoor kitchen in the backyard, Australians are embracing cooking, and eating, outdoors as a way of life. The foodie trend brings with it some good news for retailers selling outdoor appliances. “Consumers are increasingly prepared to invest in quality outdoor cooking appliances that will not only perform, but will stand the test of time,” May said. Sure to be the centrepiece of any outdoor kitchen is the DCS Outdoor Grill. 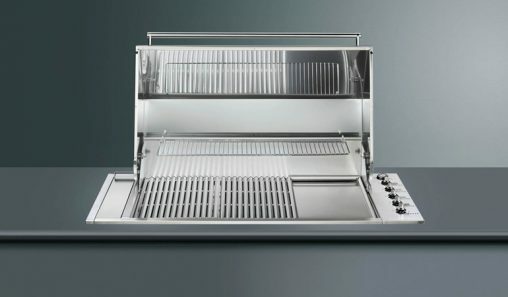 These are American-style, premium, heavy duty, high performance grills, made by a company now owned by Fisher & Paykel. 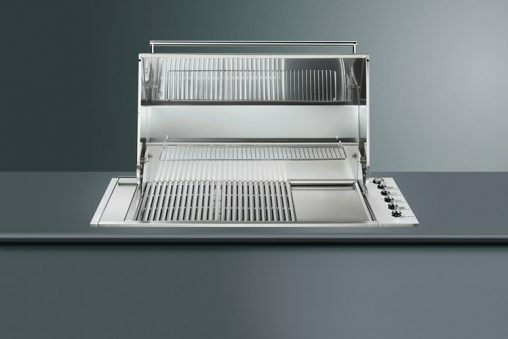 Built-in models range in price from RRP $6,598 to $7,698 and the freestanding models begin at RRP $8,596 and go up to $10,096 for the 48-inch Professional All Grill. “We would suggest that the DCS Outdoor Grill product drives the same sort of desire as a car purchase. It’s about quality, power, performance, style and, let’s be honest, status. It’s a statement piece that will do the job, and look good at the same time,” May said. Also available in a flat lidded version, the Smeg Classic Hooded barbecue (BIBQ1205AH, RRP $3,690) has five stainless steel burners, integrated fat and oil collection system, Teppanyaki plate and warming rack. Smeg will be launching new products in time for the upcoming summer on the back of what it calls “its most successful year to date in barbecues and outdoor appliances”. Unveiled at EuroCucina in Milan last April, the Smeg dual control outdoor wok burner is “the logical extension to the brand’s sophisticated collection of barbecues and outdoor rangehoods”. Manufactured in Italy from marine-grade stainless steel, the wok burner is designed to match Smeg’s existing outdoor range, adding extra functions to an external kitchen. According to Jim Kalotheos, Smeg Australia national marketing manager, Australians are more sophisticated in their expectations when it comes to barbecue cooking. “We have brought the same technology to our outdoor products as we have used in our interior cooking appliances. At the other end of the scale, are the small, portable models suitable for apartments, small backyards and balconies. From Sunbeam, the Kettle King BBQ (HG6600B, RRP $299) is an electric BBQ oven with kettle style roasting lid, temperature gauge and flat and ribbed 2,400-watt dishwasher-safe grill plates. “Electric barbecues offer many great advantages, such as quickly reaching high temperatures, electricity never runs out (unlike gas and charcoal), being energy efficient and easy to clean,” she said. Sunbeam sells a range of energy efficient freestanding electric barbecues with high 2,400-watt power, such as the Kettle King barbecue (HG6600B, RRP $299).The domed kettle lid converts the barbecue to an oven with the cast-in element transferring maximum heat. The combination ribbed and flat grill plate adds cooking versatility and is also safe to put in the dishwasher. Berra said electric barbecues might be the best option for some consumers who may be restricted by use of gas or charcoal by their rental or housing association. And, the best way to sell and electric barbecue? 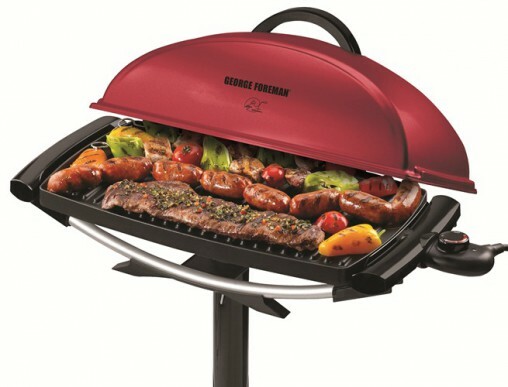 Distributed by Spectrum Brands, the George Foreman Indoor/Outdoor Barbeque Grill (GGR201RAU, RRP $129) can be placed on a benchtop or mounted on a stand and is designed to keep food away from grease and drain off excess fat. Monika Kamienowska, product manager, home appliances at Spectrum Brands said when selling a barbecue it is important to understand the space limitations consumers may have. “With the growing popularity of apartment and unit living, outdoor space is often restricted to a balcony or a small courtyard,” she said. With this in mind, George Foreman, offers the Indoor/Outdoor Barbecue Grill (GGR201RAU, RRP $129), a “compact yet highly versatile solution for consumers looking for the benefits of a standard barbecue and the versatility of using it inside or out, no matter their space situation. “As the mercury begins to rise, and the evening sun stays out that little bit longer, the urge to get behind a barbeque increases. We tend to invite our friends around for a simple barbeque and make the most of the extra bit of sunlight after work,” Kamienowska said. The Smart Grill Pro (BGR840BSS, RRP $349) from Breville folds out into barbecue mode and has an integrated temperature probe so users know when the meat is cooked as desired. Breville’s Smart Grill Pro (BGR840, RRP $349) features an integrated probe that knows when the meat or fish is done, and tells you when to take them off to rest. The flat and ribbed plates are removable and dishwasher safe. The Smart Grill Pro also folds out flat like a Korean barbecue making this the ultimate entertainer’s indoor/outdoor grill. “As food trends like Paleo grow in popularity and legislation emerges preventing many apartments from using gas barbecues on balconies, we expect a surge in the popularity of premium electric grills,” said Richard Babekuhl, Breville marketing manager. 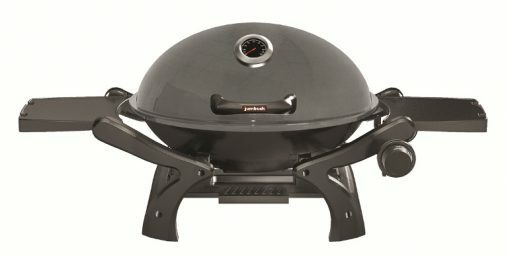 Bunnings exclusive: Jumbuck Portable Barbecue (3180545, RRP $189). If hosting a barbecue, consider how many people will be catered for – will it be a small family meal or feeding a whole football team? A two burner barbecue will easily cater for up to four people while a six burner will allow cooking for much larger groups. Match the barbecue size to the area. Compact portable barbecues suit small courtyards or apartments while larger outdoor kitchens are best for big decks and patios. Consider the fuel source of the barbecue. Gas is ideal for beginners as it is easy to turn on and there are no messy ashes to clean up. For an authentic barbecue taste and experience, choose a charcoal fuelled barbecue. To experience the best of both worlds use a charcoal gas grill that uses gas to light the charcoal, providing a traditional smoky flavour without the hassle of lighting coals. Flat top barbecues are ideal if catering for big numbers as they have a larger cooking surface, are easily portable and will fit almost anywhere in the backyard. Round kettle barbecues are perfect for roasting as their round shape circulates heat to cook meat slowly and evenly in its own juices, giving food a succulent flavour and tenderness. 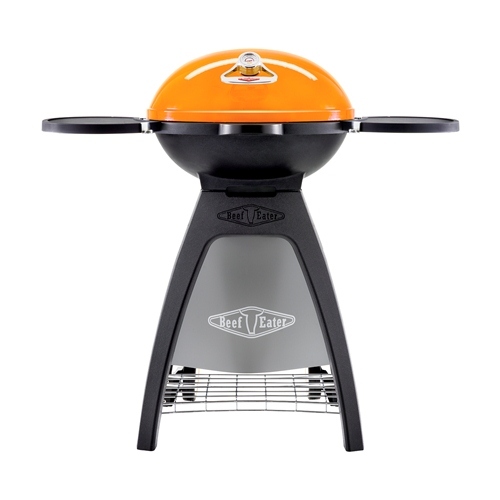 Hooded barbecues are all-rounders as they can be used as a hotplate, grill or an outdoor oven. The hood traps in heat to give food a fabulous flavour and many hooded barbecues come with extras such as rotisseries, side burners, a built-in thermometer, hood lights and glass windows. Safety valves make for a great additional sale. 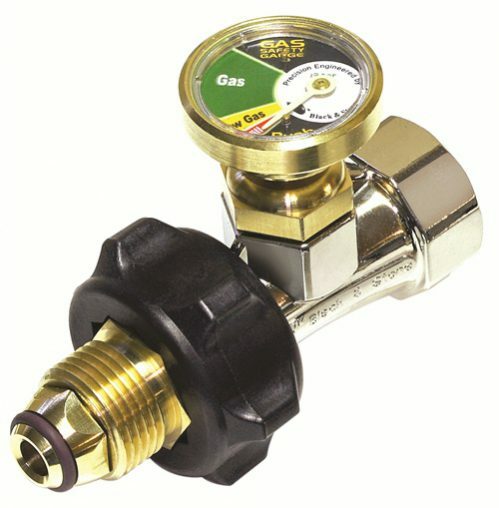 The Gas Safety Gauge from Black and Stone connects to your gas cylinder and is a smart way to guarantee home safety and avoid the inconvenience of running out of gas. There are three products in the range, pictured is most popular product, the Standard POL Fitting Gas Safety Gauge (GSGAU RRP $34.99). “Add-ons and accessories can assist retailers to build their profit-to-sales ratio. For almost all product categories in the retail environment, profitability is in the ‘add- on’ or accessory sale and that can mean the difference between making $30 profit on a sale or $100 on a sale,” said Black and Stone marketing manager Chris Florac.